The racing season really took off this weekend for our members who took part in no less than eight different races. 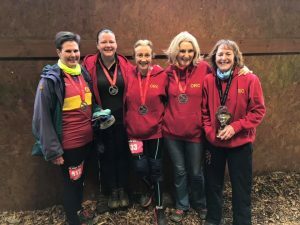 There was a good ORC presence at the Greater Manchester Marathon and this is Jo Bradford’s report on it. A fantastic day out for the ORCs in Manchester’s Marathon today in perfect running conditions. The day started cool and overcast with sunshine breaking through later on. Manchester is billed as the UK’s flattest marathon and as such is a popular place for people looking for fast qualifying times for the major marathons. The ORCs were no exception with several out hunting for good for age qualifying times for London 2020, club records and PBs and they romped home with fistfuls of them. The ever speedy Jeremy Tandy flew round the course and was first ORC back with a fantastic 12 minute PB in a time of 03:02:52. Second ORC home and First Lady ORC was Jo Page who has had difficulties with staying on top of her training program due to work commitments and was therefore concerned going into the race. But of course she stormed round finishing with a 6 minute PB and club record in a fantastic time of 03:16:34. Graham Bryant found the going tough today and was simply “pleased to finish in one piece” in a time of 03:37:44. Jo Bradford was running her first marathon, she followed an unusually low mileage training plan which paid off perfectly, as she achieved her target of a sub 3:50 first marathon and also set a new Vet45 club record by 6 minutes in a time of 03:49:10. Karen King and Tom Andrew were also out running in their first marathons today, they had done the majority of their training together and ran the race together too, very happy to have soaked up the atmosphere and comfortably finishing inside their 4:30 target time in 04:17:19. Jeremy Tandy, Jo Page and Jo Bradford are all waiting to see what the 2020 London Marathon Good For Age qualifying times will be when they’re published next month, as they have all achieved qualifying times today based on the current GFA target times. Two ORC travelled much further to take part in their marathon. 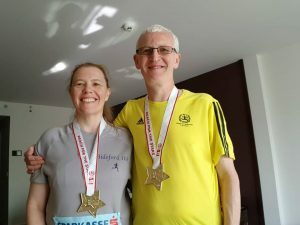 Andrew Vernon and Lotte Smith chose the Vienna Marathon which takes in the city’s most impressive modern and historic sights including the famous Opera house. For Lotte this was her first attempt at a marathon and Andrew had only completed one other 24 years ago. Both enjoyed their races, Andrew finishing in an excellent 3.17.12, a 12min PB on that previous run and Lotte was very happy with her time of 5.05.32. Much nearer home was the Taunton Half Marathon and Marathon. As well as running a brilliant race, Hugh Robinson wrote a great report on it. Good times in the town on the Tone! 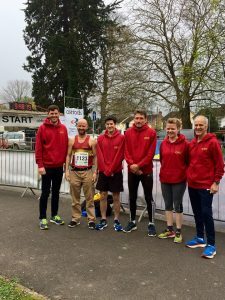 ORC were well represented at the Taunton Half Marathon this morning.The conditions were as good as it gets with cool, overcast weather accompanying the runners round the relatively flat course on a single loop round the Tone river valley. First ORC home was Rob Kelly in 15th and a time of 1:19:33 (also the 1st MV35) – not bad an end to a 70 mile training week. Next home was yours truly in 1:20:44 – 2nd MV40 and a PB by nearly 2 minutes (marathon training is clearly paying off). Paul Carter faded a little thanks to a stinking cold, but still ran an impressive 1:22:54 (3rd MV50). Those three placings won ORC the first male team prize – beating Taunton into second on their home race! Stephen Sincock followed with another vet victory, this time in the MV55 race, in 1:26:29. Paul Evison continued his impressive form with a new PB of 1:47:04 and 5th in the MV65 category. The sole ORC lady was Rachel Haydon happy in 2:10:37. Andrew Thorne headed out for a second lap of the course in the marathon distance and completed in 3.46.46. 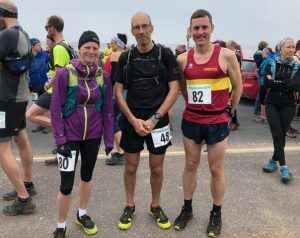 The South West Coast Path was the location for three Okehampton runners to tackle a very challenging race on Sunday. The Exe to Axe is a point to point race which, at 22 miles, is in fact longer and tougher than the iconic Grizzly, although lacking the kudos of that race. With nearly 4,000ft of ascent, the relentless hills and steps, particularly in the later stages, make this a real test of endurance . This didn’t worry Paul Crease who stormed round to complete in an incredible time of 3.17.45, while Stephen Gentle also ran a great race to finish in 3.24.05. Christine Fritsch has completed this race once before, but this year was using it as a training run for her upcoming Three Peaks Race and was happy with her run in 5.24.07. The South Devon coast path was also the location for Trail Events’ South West Coast Path Trail Challenge on Saturday where Okehampton had runners in the Half Marathon and the 12k.The runners westwards from the start at East Soar Outdoor Centre across fields towards Bolberry Down, following the coast path back to Bolt Head before heading back uphill to East Soar Farm. The 22k continues on from Bolberry to Hope Cove then joins the coast path back to Overbecks House before heading back to the finish. Conditions underfoot were surprisingly good after the rain, but the strong easterly headwind made the run back along the coast very hard work. Sarah Marvin ran a fantastic race in the half Marathon, finishing in 2.15.59 to be placed 3rd Lady. Kate Wilson was the first ORC in the 12k with an excellent time of 1.17.22, followed by Jane Jackson in 1.23.55, Deborah Cunningham in 1.30.42 and Claire Sprague in 1.41.15. One Okehampton Running Club member, Jo Turner, faced a big challenge on Saturday when she took on her first 50 mile Ultra Marathon. Jo is an experienced runner over big distances but this was the first time she had tackled this distance in one day. Centurion Running’s South Downs Way 50 starts in Worthing and follows the South Downs Way to Eastbourne, where the runners finish with a circuit of the running track. Jo ran really well until a knee problem started to slow her down and then became increasingly painful forcing her to retire after 37miles. Matthew Richards came in second in the monthly Park Run with a amazing time of 19:56mins a PB for him also. Thanks Jane, Hugh and Jo Bradford who contributed this week. Error: Error validating access token: Session has expired on Saturday, 20-Apr-19 03:20:42 PDT. The current time is Monday, 22-Apr-19 11:49:38 PDT.